Background: Clobazam (CLB) has been used as an anxiolytic, anticonvulsant and antiepileptic drug under the trade names, Frisium, Urbanol, Onfi and Tapclob. Impurity profiling in the pharmaceutical industries is a central task in the manufacturing of drug product. The quantification of impurities in active pharmaceutical ingredients (APIs) is also receiving considerable importance from the regulatory authorities in the point of stringent quality requirement. Thus, the provision of substantial quantity of impurities as standards, which are accomplished either by isolation from crude reaction mass or the synthesis of material with proposed structure using new synthetic route, to analytical method development and validation is a good demand. Therefore, easily accessible synthetic routes to the preparation of impurities with the lowest cost are sought after. To date, no synthetic specifics were found on the synthesis and characterization of CLB Imp-B, -C, -D and –F, and the synthesis of CLB Imp-E. Therefore, the comprehensive study was undertaken on the synthesis and characterization of CLB related impurities and this study might be useful to prepare CLB impurities in the required quantity with purity to use as a reference standard of analytical method development in pharmaceutical industry. Methods: The synthetic routes were developed for the synthesis of CLB impurities such CLB Imp-B to Imp-F and isolated them using purification techniques with purity in the required quantity. The commercially available key starting materials, reagents and solvents were used in the course of synthesis of impurities. The analytical techniques such as NMR, IR and mass were used to characterize the structure of synthesized CLB related impurities. Results: The easy accessible synthetic methods were developed for the synthesis of clobazam related impurities, CLB Imp-B to F in good to excellent yields with purity as well as described the cause to formation of these impurities. The KSM related impurity, 2-chloro-1-nitrobenzene and the active methylene hydrogens in clobazam are caused to the formation of CLB Imp-B and CLB Imp-C&-D, respectively. CLB Imp-E and –F are formed due to the degradation of drug molecule, CLB in the presence of base (NaOH). CLB Imp-B was prepared from 2-chloro-1-nitrobenzene by following similar process of CLB reported in the synthetic specific. CLB Imp-F was prepared from 5-chloro-N1 -phenylbenzene-1,2-diamine by coupling with mono-methyl malonate followed by N-methylation using dimethyl sulfate. The rest of all impurities were planned to prepare by taking CLB as starting material. CLB Imp-C and –D were synthesized by treating CLB with methyl iodide in the presence of inorganic base. The mixture of aqueous NaOH and CLB was agitated vigorously at 75-80°C to obtain CLB Imp-E. All the synthesized compounds were purified using purification techniques such as crystallization and column chromatography, and well characterized by IR, ESI-mass, 1H NMR, 13C NMR and DEPT analyses. 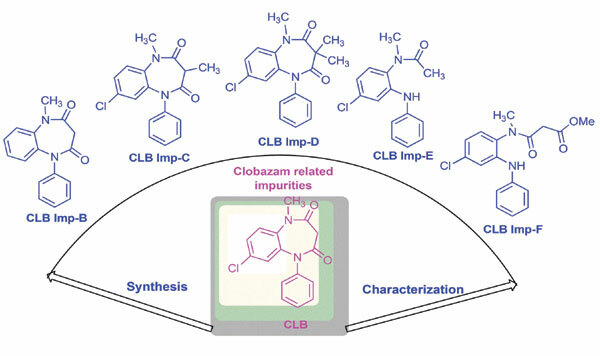 Conclusion: The immaculate discussion about synthetic approaches and structural elucidation using analytical applications such as IR, NMR (1H, 13C and DEPT) of CLB Imp-B to F, which are listed in the European pharmacopoeia monograph of clobazam, has been described. All the impurities were obtained with stringent purity (>98%) in the described synthetic routes and the same impurities have been used in analytical method development in our pharmaceutical industry. Also, the plausible mechanistic path ways to the formation of impurities, keeping in view the regulatory importance of clobazam, were discussed in detail. Keywords: APIs, clobazam, characterization, EP impurities, synthesis, NMR. Keywords:APIs, clobazam, characterization, EP impurities, synthesis, NMR. Abstract:Background: Clobazam (CLB) has been used as an anxiolytic, anticonvulsant and antiepileptic drug under the trade names, Frisium, Urbanol, Onfi and Tapclob. Impurity profiling in the pharmaceutical industries is a central task in the manufacturing of drug product. The quantification of impurities in active pharmaceutical ingredients (APIs) is also receiving considerable importance from the regulatory authorities in the point of stringent quality requirement. Thus, the provision of substantial quantity of impurities as standards, which are accomplished either by isolation from crude reaction mass or the synthesis of material with proposed structure using new synthetic route, to analytical method development and validation is a good demand. Therefore, easily accessible synthetic routes to the preparation of impurities with the lowest cost are sought after. To date, no synthetic specifics were found on the synthesis and characterization of CLB Imp-B, -C, -D and –F, and the synthesis of CLB Imp-E. Therefore, the comprehensive study was undertaken on the synthesis and characterization of CLB related impurities and this study might be useful to prepare CLB impurities in the required quantity with purity to use as a reference standard of analytical method development in pharmaceutical industry.